NETWORK FINALS: NCIS: LA and BOB’S BURGERS gained 0.1 in final numbers, while THE SIMPSONS, INSTINCT and DECEPTION each lost the same. CABLE HIGHLIGHTS: It was a busy night for scripted cable. THE WALKING DEAD rose 0.12 from last week to 2.95, and the “sneak” of the first hour of THE TERROR that followed it was at 1.34 (although it had a boost not just from its timeslot, but by AMC bundling together the 2 shows for DVR purposes on at least some systems, and the rating was down to 1,03 by the final 15 minutes), with TALKING DEAD (airing an hour later than usual) down 0.49 to 0.60, and COMIC BOOK MEN down 0.04 to 0.16. On Adult Swim, MIKE TYSON MYSTERIES shed 0.06 to 0.52, MR PICKLES was at 0.33/0.31 compared to last week’s 0.39/0.35, and SUPERMANSION was down 0.08 to 0.25. Disney Channel’s STAR WARS: FORCES OF DESTINY was at 0.34 (after a 0.78 lead-in from the theatrical movie ZOOTOPIA). On Showtime, HOMELAND ticked up to 0.32, and the season premiere of BILLIONS was at 0.26, up 0.06 from 2017, while OUR CARTOON PRESIDENT held at 0.05/195K. On HBO, the season premiere of SILICON VALLEY was down 0.13 from the 2017 premiere (which had THE LEFTOVERS as its 0.34 lead-in) to 0.31, BARRY premiered at 0.22, and HERE AND NOW was steady at 0.11. FX’s TRUST premiered at a low 0.20. Hallmark’s WHEN CALLS THE HEART fell 0.07 to 0.19. On E!, THE ARRANGEMENT ticked up to 0.20, and THE ROYALS gained 0.03 to 0.18. Starz’s ASH VS EVIL DEAD rose 0.04 to 0.10. 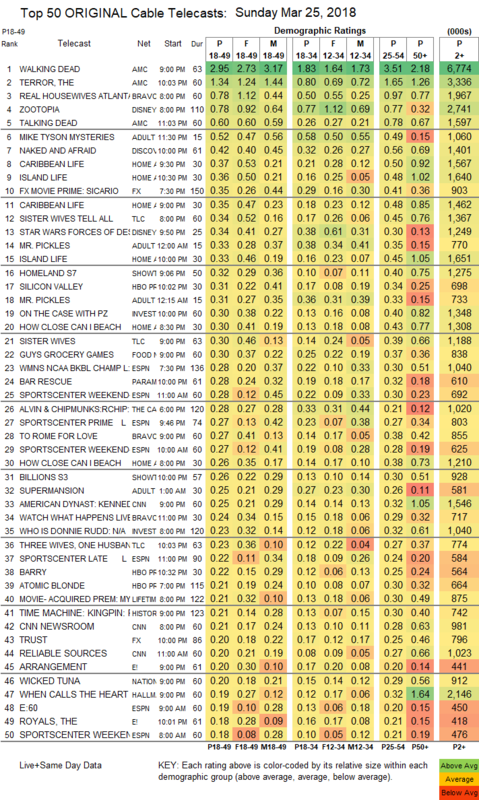 Bravo’s REAL HOUSEWIVES OF ATLANTA topped unscripted, down 0.02 to 0.78, with TO ROME WITH LOVE up a tick to 0.27. 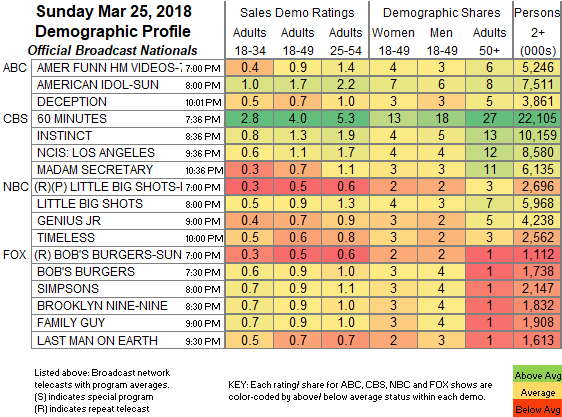 Discovery’s NAKED & AFRAID lost 0.04 to 0.42. HGTV’s line-up was led by CARIBBEAN LIFE at 0.37/36 and ISLAND LIFE at 0.36/0.33, compared to last week’s 0.33/0.29 and 0.36/0.33. On TLC, SISTER WIVES TELL ALL was at 0.34, ahead of SISTER WIVES itself, which was down 0.13 to 0.30, with 3 WIVES 1 HUSBAND down 0.02 to 0.23. On ID, ON THE CASE ticked down to 0.30, and WHO IS DONNY RUDD was at 0.23. Paramount’s BAR RESCUE ticked down to 0.28.